Named in honour of the Cedar of Lebanon tree (Cedrus libani) planted in the school grounds by botanist Peter Collinson, Cedars house was originally built as a sanatorium following an outbreak of scarlet fever in 1877. Later used as staff accommodation, Cedars was a girls’ boarding house from 1997 until 2005, when it became a mixed day house. Cedars moved to the main School building in 2017. Our House prides itself on an inclusive and supportive atmosphere where pupils interact across year groups, both informally and through the numerous inter–house events in the School calendar, where we have enjoyed both success and the taking part. 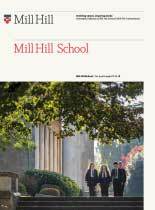 Pupils are encouraged to make the most of the wide range of opportunities and support available at Mill Hill School and to enjoy and value the process of learning. In an ever changing educational landscape, skills such as communication and reflection are vital and we aim to foster a supportive environment where pupils can develop the confidence to communicate thoughtfully and productively with others. Similarly, a willingness and ability to reflect on things when they don’t quite go to plan is promoted, along with an appreciation of success and the importance of endeavour in this.